Grimshaw were engaged to provide urban planning and station design services for the Springvale Road Project Alliance. The design incorporates an elevated concourse, pedestrian connections, bus interchange facilities and station and platform architectural elements. The project was undertaken as an alliance project for the design and construction of a grade separation of Springvale Road and the associated rail infrastructure. Integration of architectural elements such as the concourse canopies with associated ETFE pillows provide extensive weather protection to commuters whilst allowing natural daylight to filter through onto both the concourse level and underpass level below. The structure also allows an open and spacious environment with a single line of column supports freeing up visual and physical obstructions on the concourse level. The prefabricated station amenity pods incorporate modern facilities for staff as well as waiting room and retail areas for commuters. The pods are clad in a highly robust vitreous enamel panel which creates an identity for the station precinct while also providing long term durability. The underpass zone has been designed to be a light filled area, using the integration of extensive voids within the concourse level above. This, together with a central spine of perforated metal panels and associated lighting to the soffit of the underpass, aims to increase the light and visual amenity in this area. Springvale Road is an important north-south link in Melbourne’s eastern suburbs. The Belgrave-Lilydale rail line, which provides commuter rail services linking Lilydale and Belgrave with central Melbourne, is a significant part of Melbourne’s suburban rail network. At Springvale Road, some 218 trains pass through the level crossing each day contributing to significant congestion for the 50,000 vehicles which also use Springvale Road each day. This also represents a safety risk to the transport network. Now complete, the station design has eliminated any need for the rail level crossing that previously existed at Springvale Road, so provides improved travel times and better safety outcomes for pedestrians, road, and rail commuters. 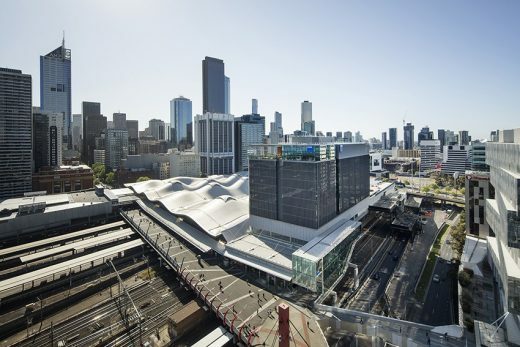 The project was driven by the imperative to minimise disruption to transport users during implementation and adopt the shortest possible construction period, while giving commuters a safe and state of the art public transport interchange facility.